A Squirrel Proof Bird Feeder That Really Works! Need a squirrel proof bird feeder? Don't we all! Sure, squirrels are cute and fuzzy and fun to watch until....until they become you're worst enemy at your bird feeders! "This is a Great Bird Feeder & Squirrel Buster!" " "This squirrel proof bird feeder is the best I've had, and I have had a bunch. It has a huge capacity so you don't have to fill it very often. It is almost impossible for squirrels to stand on and if they manage to get a foothold their weight closes the feeding ports so they can't get anything. You can adjust it to exclude large birds such as starlings and grackles. When it needs to be cleaned you just put it in the dishwasher. And how many times have you've seen pictures of squirrels feasting at squirrel proof feeders? Finally, a Squirrel Proof Bird Feeder that really works! We've done some searching, and based on 2019 consumer reviews the Brome Squirrel Buster Plus is one of the best at deterring squirrels. How it works: Openings in the bottom section of the feeder align with seed ports providing birds access to the seed. When a squirrel or large bird lands on the perch, its weight automatically forces the "door" down, closing the seed ports. This video from Brome shows birds feeding, squirrels not winning and a little about the feeder assembly. A little long, but nice to see the feeder in action. 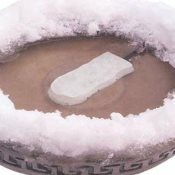 Dishwasher Safe : High water temperatures and powerful dish detergents clean and sanitize every bit of your squirrel proof bird feeder. Clean feeders are as important to wild birds as clean dishes are to humans. Wild bird safety is deadly serious business. Spread the word about safe feeders to your friends and family. Adjustable Posi-Grip perch : Squirrel Buster Plus perches are adjustable in length and lock into place. Thick perches and textured surfaces provide a secure and comfortable grip for birds. Perches can be shortened to attract small birds such as chickadees and finches while deterring larger birds such as grackles and starlings. Perches can also be extended just enough to attract medium sized birds such as grosbeaks and woodpeckers. Ventilated: Transparent bird feeder seed tubes are like greenhouses, they trap solar energy. The air in Squirrel Buster Plus rises and escapes through unique waterproof vents at the top of the feeder. The escaping heated air is replaced by fresh air entering the bottom of the tube through the seed ports. The birdseed remains fresher and attracts more birds. Damp and decaying seed decreases bird traffic and can spread disease. Adjustable weight spring: You can increase or decrease the tension of the trigger spring to prevent nuisance birds such as grackles or blackbirds or other pests such as chipmunks from feeding. Squirrel Buster Plus with Removable Cardinal Ring: This optional posi-grip ring system has been specifically designed to attract cardinals. These perennial favorites have two very distinct features: small necks and big feet. They prefer gripping a thick-textured perch and facing their food source directly. Cardinals dislike turning their heads to feed. The Squirrel Buster Plus Cardinal Ring perch system allows them to eat facing the seed while providing a secure and comfortable perch. 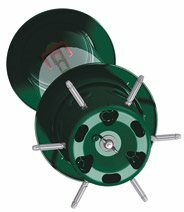 These cardinal-friendly feeding features combined with a bush level location make Squirrel Buster Plus very inviting to cardinals. 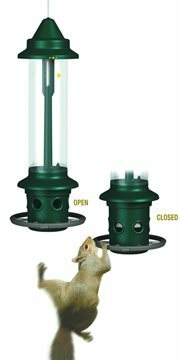 No Batteries Required and is Humane to Squirrels : Some other popular squirrel proof bird feeders require batteries that are drained quickly and power is not reliable. Also, there is no "shocking" or other direct physical harm to the squirrels, perhaps, just their egos! 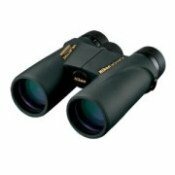 There are also several models that vary in price. The latest model is the Brome 1024 which is the one we discuss on this page. There is also the classic version, a finch model and a mini version, all listed below. Believe it! It is squirrel proof! "After trying several feeders with little success the Brome squirrel proof bird feeder fits the bill. It is easy to fill and hang, and keeps the squirrels and large birds out of the food. It is very attractive and performs as claimed. I highly recommend this feeder." Place your feeder out of reach of squirrels. This may seem obvious but squirrels can jump up to 10 feet to your feeder from trees limbs, fence posts, shed roofs, etc. Attach a squirrel baffle on pole-mounted feeders to keep squirrels from climbing up from the ground. 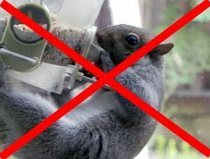 If you hang your feeder from a horizontal line, you can place several cut pieces of pvc-type pipe or other plastic tubing over the line which will spin if a squirrel tries to walk on it. You can also hang your feeder using fishing line which is very thin and makes it difficult for a squirrel to balance and walk on. 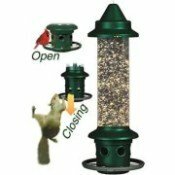 We also have found this Squirrel Proof Bird Feeder Pole system to do an excellent job at keeping the squirrels from stealing bird seed by integrating a floating squirrel baffle. Here is a great article, What Can You Do About Squirrels (pdf file, opens in new window) from BirdNotes from Sapsucker Woods, the Cornell Lab of Ornithology's newsletter. Where to purchase your Squirrel Buster Plus Feeder? Hope you find your squirrel proof bird feeder to be as effective as others have experienced. To know what kind of wild bird seed to use in your feeder and attract the species you desire, click here for more info about wild bird food choices or visit our bird feeders main page. Feed the squirrels away from your bird feeders as an alternative option to the fight, then perhaps everyone will be happy. If you do not want to build your own, here are some ready-to-go squirrel feeders. You can also make your own wrap-around homemade squirrel baffle as double insurance to keep the squirrels off your feeders. Looking for Brome Squirrel Buster Feeder replacement parts?